This moldable insert serves as an effective thermoplastic lumbo-sacral orthosis. It can be heated either wet or dry to mold into a custom fit. 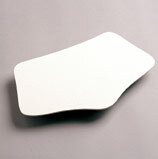 May be used in the posterior pocket of the Back-n-Black with Thermo Pocket, Back-n-Shape II, or Back-n-Shape contoured.